. Last edited 14:35 7 Nov 2018. We are delighted to present our new Monthly publications, formerly known as Data Review, which will share our short-term forecasts. Please note that users licensed for the data service can access our UK gas balances by clicking here. The NBP appeared tight heading into October with low pipeline flows and underground stocks well shy of capacity, but a massive rise in LNG supply has since bolstered stocks, loosening the supply-demand balance. With LNG supply now forecast to post heavy y/y increases in Q4 18 and gas into power demand likely to be soft, we should see the NBP shed some of its premium to continental hubs, as continental flows into the UK ease. The UK spent Q3 18 balancing amid tighter supply by slowing exports to the continent and late summer market expectations were likely focussed on an early winter call on continental gas. 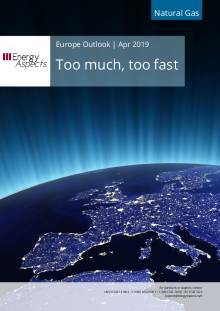 Instead, the UK system was hit in October with a hefty 0.4 bcm (149%) y/y rise in LNG sendout, the largest monthly volume since May 2017, while gas into power fell on higher French power imports, supported by higher French nuclear capacity. Those supply-demand dynamics led the UK to inject heavily into underground storage and increase LNG stocks, loosening the supply-demand balance for November. Continental imports into the UK have yet to begin this season, and may not do so in earnest until December, unless the weather turns colder than average. 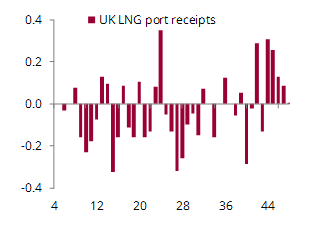 The October wave of LNG is set to continue this month, with total scheduled UK port receipts already up 0.47 bcm y/y at 0.62 bcm, and there is plenty of time to add more to the schedule given we are only a week into the month. 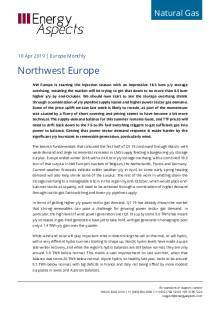 With NE Asian demand for spot cargoes having ebbed on much warmer weather in that region, growing LNG stocks in Europe are likely to continue to support LNG sendout. The swift change over the past month in stock levels has dropped NBP prices and led the UK hub to shed some of its premium to the continent, trading at an average +0.21 €/MWh (down around 0.12 €/MWh in both m/m and y/y terms). The narrowing of the NBP-TTF spread should continue at least through Q4 18, provided the weather is seasonally normal. 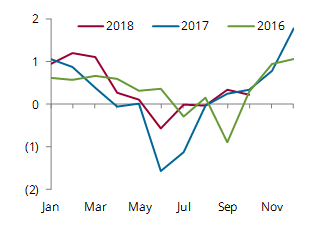 Looking ahead to summer 2019, the most significant change since last month’s forecast is a tighter supply-demand balance in August-September due to a heavier schedule of Norwegian maintenance, which should cut supply to Europe y/y in the second half of summer. LNG supply should continue to post y/y gains all summer, but the sharp drop in Norwegian take should lead the UK to ease late summer exports to the continent, despite the planned commissioning of reverse flows on the BBL pipe.